Penny board vs Longboard – Whats Best For You! In short, You cannot go wrong when choosing santa cruz boards. 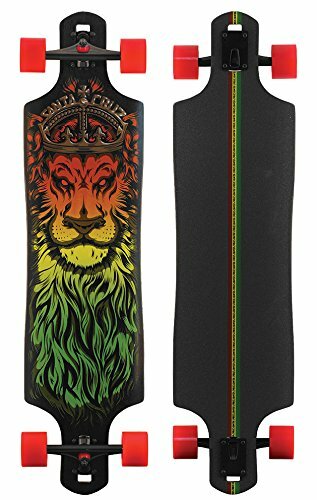 Santa Cruz Lion God Rasta Drop Thru Cruzer Freeride Longboard Deck Complete 40"
Santa cruz lion longboard offers a new shape with drop through mounted deck. The african design of the board is bound the make you stand out from the crowd. The stunning board is 40 inches long and 10 inches wide. The deck of the baord is made of high quality maple which is super strong and durable. You can expect to last a few years without breaking. The board offers some of the smoothest and nice ride over hard and rough surfaces. If you live in a neighbourhood with bad you should buy this one immediately. Risky riders are gonna fall in love with this board as its not only fast board but gains momentum quiet easily as well. Basically, it will take where you need to go. You can ride this miles at a time without any problems. Right out of the box, the trucks are too tight for turning and carving. It has an easy fix. The board is breathtakingly beautiful. The design and color are some of the best. Its killers looks are alone makes it worth buying. Combine it with jam packed features and decent pricing and you got winner there. Definitely worth checking it out! Similar to Lion god longboard, Santa cruz skate land shark is one of the visually stunning boards. The color grading is light and friendly. The cruiser board is small and lightweight. If you are somebody who likes to strap the board on the back and take it with you, then you should buying this board should be a no brainer. The board boasts fo sturdy deck for stable ride. The kick tail is a nice touch for keeping the ride fresh. The graphics on the bottom and top are not only well done and detailed but also durable. The spray on grip tape promises traction without spoiling the grahics on the board. The 78a road rider wheels are translucent and keep the ride noise free and super smooth. The abec 7 bearing are standard quality nothing exceptional. It's really lightweight and portable board for people who like to strap it on their backs. The board delivers an easy riding experience for a affordable price. Worth checking it out. They're Cruzers, not longboards! Mahalo! Mahaka Rasta is another fantastic board in this list. The cruiser board Is designed for island lifestyle. It feautres a really deck that does not flex. The deck does not even flex. If you are bit heavy site, then you should seriously consider this board as it will not break by your weight. The design is flawless and looks absolutely stunning when riding. The abec bearings are standard in the market. The built in bottle openers works well too. You might have to replace the bushings in the truck as they are not as responsive as you want them to be. Bushings are really cheap so it should nt be a problem. It's a near perfect for starter riders and perfect who loves cruising around. Its a high quality product with soft wheels that promises a smooth and fun filled ride. Highly recommended. Ten toes longboard is one of the most popular boards in the market for the right reasons. Its affordable, made from the best and eye catching. We have compiled a comprehensive and detailed review along with advantages and disadavantages that will help you make a better buying decision. Without wasting time lets hop onto the details below. The heart of any longboard is its deck. Its 44 inch long which gives insane amount of space for riders to keep their feet. Its ideal size for cruiser boards. It is made from high quality bamboo material to give it a classic old school look. The deck is available in both pin tail and cruiser styles. You can choose the style that suits your needs the best. The kick tail at the back keeps the ride fresh and fun. The sharp nose allows the rider to cut thought the air and gain momentum with ease. The concave depth in the deck offers stable foothold. The deck is super strong and will not to break anytime soon. The wide and soft wheels are very durable and delivers silent and super smooth ride. In short, the wheels function great and are of top quality. About Bearings, honestly they are generic and aren't the best in the market which can be said most longboard in the market. However, they do function decent. Your neighbours will love them as they do deliver a quiet and noise free ride. If you are not satisfied , you can replace the wheels with better quality ones in the market and expect significant improvement in speed and riding experience. Apart from being a technical marvel, this board also shine great in the visuals as well. The board looks like a million bucks. It's available in 12 different styles and colors to give rider enough choice to match his personality. The graphics on bottom of the deck is durable and will not fade in away in future. All of the color styles are well made and looks beautiful in sunshine. The trucks are of decent quality and do their function well. They re adjustable so you can adjust them as per your needs at the time. They’re extremely tight right out of the box which makes them very hard to turn. Loosen them before you go for a ride. If you are unfamiliar, we recommend you to go to a local shop and ask them to do it for you. Here are a short summary for you. Not the best bearing but not entirely useless. The board is plain amazing and everything you can ask for. Its high quality that is built to last for years. Its comes in affordable range which makes it even better for consumers. Definitely worth checking out. 1) How to change the loosen the trucks of the board? 2)What is the weight limit of the this longboard? Its 250 pounds which is good enough for most adults and kids. 3)is it easy to carry around? The weight of the board is 8 pounds which makes it light, easy and comfortable to take it with you. Are you on tight budget and do not want to dig a hole in your pocket to buy a longboard? Yet every longboard in your price range is made of cheap quality and is just not upto the mark. Fortunately, Volador longboard is one of the few longboard in this price that offers premium features. With this detailed review, you will be more than enough informed to make decision wether the board is right for you not. Let's jump into the details below. The deck is made from 8-ply hard maple material that is both strong and durable. The deck of the board is concave shaped that allows good control and stability for the rider. The drop down deck drop through camber deck offers shock absorption to keep the the ride smooth even on rough surfaces. Its especially great for people who live in areas with bad road facilities. The shape of the board is designed in a way that the board avoids wheels from all angels. For beginners, wheel bite is when the wheel touches the board and disrupts the ride. This helps the rider to enjoy extreme manoeuvrability and take sharp turn at any given time without worrying. The length of the deck is 44 inch and 9 inch wide which gives rider's feet more than enough space to keep their feet . With high weight capacity, even heavy individuals can enjoy joyful and speedy ride. The trucks are forged by top quality genuine aluminium alloy. They work well with wheels and delivers a quiet ride. The bearings that come with this are abec 7 grade which aren't of the best quality. But they do keep the ride silent and noise free. They're useable and do deliver where it matters. If you want, you can replace the bearings with better quality ones from the market. Getting a better bearings will definitely enhance the ridding experience significantly. Graphics and colors are last thing you should look for when buying a longboard. Although, it doesn't hurt tat the board is stunning. The graphics on the deck are beautiful and make you stand out from the rest. The board is vibrant and cheerful. Be ready to get a lot of attention when you take it out for ride on the road. The design on grip tape is adorable and sweet. It's available in 5 different color to match your personality. The different art styles have been taken inspiration from different cultures. You can find variety style to suit kids, adults, boys and girls. Unlike other boards, the graphics do not fade away even after using the board for years. The weight of the board is 8.4 pounds which is relatively low as compared to its size. Even though the board is super lightweight, It is not exactly efficient to carry around on back. However you can easily carry it one hand. Longboarding is all about enjoying nature and appreciating earth’s beauty. The Volador longboard has been made by Volador company that the board is 100% environment friendly. When you know that board means is environment friendly, it will give you positive feeling of giving back to the nature and make you proud of having this board. Overall, Volador longboard is undoubtedly one of the finest longboard available in the market. Its simple cruiser board that gives the best bang for your buck. With this review you have enough knowledge to see if it fits your bill. Highly recommended and worth checking out. Are you looking for a quality longboard that will full-fills all basic needs? Quest longboard cruiser is one of the best longboard in the market. Its made of high quality components that is not be be seen in this price segment. The board is perfectly affordable to have tons of fun on. Let's hop in to the details below. The board is designed just right for beginners and experts alike. The deck, bearings and trucks are fitted perfectly to offer a smooth ride in your neighbourhood. The grip tape completely covers the board and is high quality as expected. This board holds good traction and works well even on wet surfaces. The kick tail and nose dive is quite adorable as well. The abec bearings does decent job to keep the ride fast and silent. The abec bearings keeps the ride silent, fast and super smooth. From top to bottom the board is absolutely beautiful. The pictures dont justify how visually stunning the board really is. The plain graphics on the bottom of the deck is wonderfully done. The graphics suits incredible well to bamboo look of the board. You can expect to get alot of attention when taking out for ride in a park. The board is made of premium grade materials which makes it super strong and tough to crack. That means you can expect this board to last couple of years if used correctly. The longboard is constructed with built to last quality. The length of the cruiser board is 44 inch which is great fit for bigger indivisuals. It has more than enough space on the deck to position your foot comfortably. The weight of the board is 8 pounds. Its lightweight and easy to carry around. Fantastic choice for daily commute. The bearings and trucks aren't of the best quality but can be replaced by better parts from the market. Quest super cruiser longboard is designed for both beginners and expert riders alike. The board offers super smooth and enjoyable ride. In terms of pricing, the board offers best bang for your buck. Its almost impossible to get a quality board at this price segment unless you choose quest super cruiser. If you are on really tight budget then buying this board should be a no brainer. In short, You cannot go wrong when choosing this ride. Are you confused between the two types of board? Look no further, with the help of this guide, you will get clear understanding about both types of boards. You will be armed with more than enough knowledge to choose which suits your needs the best. Penny board is a type of skateboard. The deck of the board is a lot smaller and requires the rider to be more balanced. It's also known as mini cruiser in some parts of the country. Similar to skateboard, You can assemble the penny board by yourself by buying different parts separately or you can buy it fully assembled as well. As the name suggests, penny board are smaller and more portable than other types of skateboards. The deck of the board is small and has just enough space the riders feet. penny board comes in three three different sizes that is 22", 27" (the Nickel) and 36”. The deck of the board is usually made from high quality strong plastic. Penny boards can be used by riders of all ages. They're lightweight yet can support a lot of weight and still ride with complete ease. They easy to carry around as well. You can fit them into backpack. One of the best thing about penny board is they comes in huge color options and styles to suits your personality. The wheels are slightly broad which lets the board sail smoothly over mildly rough surfaces. Penny boards are great for cruising and daily commute. There is general misconception among the general riders that penny boards are not strong as they are small in size and made of mainly plastic. This is completely false, penny boards are super durable and can withstand even the toughest of falls with only few scratches. They are strong as any other type of board. Basically, you can expect the board to perform well for years. One of the advantage of penny board is its incredibly small size. You can fit the board you backpack and take it with you anywhere you like. Longboards are similar to skateboards or as some as say even type of skateboard. As the name goes, they’re longer than skateboards. They feature large wheels and precise hardware which makes them faster than skateboards. The length of the longboard ranges from 84 to 150 centimeters and width 22.8 to 25.4 cm. The deck of the board has more than enough space to let the rider position his feet comfortably. The deck of the longboard is made from materials like maple, bamboo and church. The size of the wheels range from 65 to 107 millimeters. The large wheels allows the longboard to sail smoothly even on the roughest surfaces. They're available in different shapes and size to serve different purposes. Drop through, pintail and cruiser are some of the names. The plain classic bamboo longboard is fantastic for custom designs. Longboard are just perfect for people who are just starting out and are still beginners. It all depends on whats suits your needs the best. If you live in area with rough roads, then longboard should be a better for you as they ride smoothly over rough gaps and surfaces. If you like a lot of room on your board to secure a strong foothold then longboard should be your best option. Or if you plan to travel with your board regularly then penny board should be better as they're more portable and lightweight. Longboard are just perfect for people who are just starting out and are still beginners. While penny board are better for people who have some experience in riding and balancing. Both longboard and penny board come in affordable price range. Both types of board has their advantage and disadvantages. We recommend you to write down what exactly are you needs and what you want to do with board along with your budget. After that see which type of board fits your bill the best and go for it. Also in case you need help, here is a list of best longboard for kids and beginners along with a helpful buying guide to help you choose the best options in the market. Some recommended products may use affiliate links. KidToysLife.com is a participant in the Amazon Services LLC Associates Program, an affiliate advertising program designed to provide a means for sites to earn advertising fees by advertising and linking to Amazon.com. Amazon and the Amazon logo are trademarks of Amazon.com, Inc or its affiliates.